Almost every home and every company around the world will have at least one fire extinguisher. In most companies there will be more than one, possibly one in every office and room in the building.You will notice that they are all the same, whether you have a small one in the kitchen at home or a large one on the wall at work, they are all red in colour, but the difference is that they have different coloured labels. 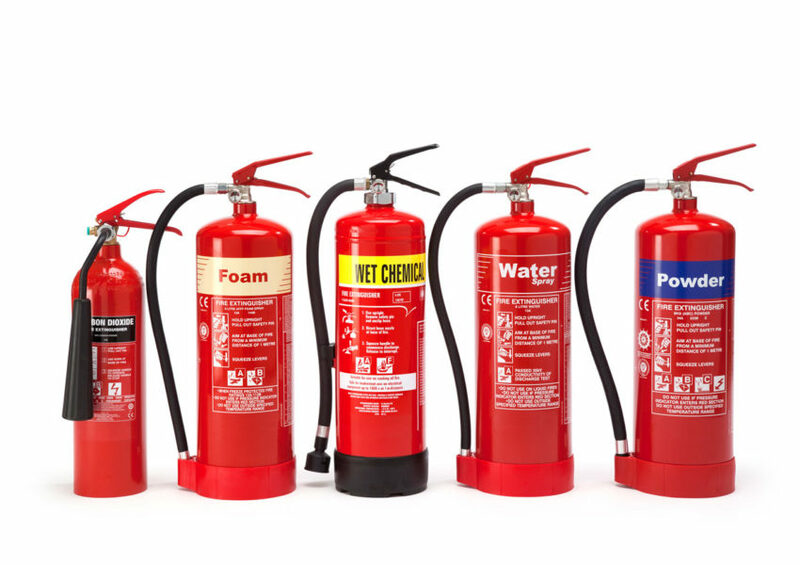 This helps you differentiate between the different fire extinguishers and it’s important you know which is which, because each one works on different materials.There is no point grabbing the fire one you see in the event of a fire and spraying the fire, only to be using a wet fire extinguisher on electrical cables. Get to know what each colour code is for and what it works on, this can help you grab the right device in the event of a fire, possibly combating the flames and calming the hot spots before the fire department arrives. The first one you will notice is the red canister with a red label. The red label is the water canister and this can be used on paper and textiles, never use on liquid or electrical fires.The next one is the red canister with a blue label. The blue label is for powder, this is the one you want to grab in the event of a liquid or electrical fire. It also works on wood and paper, so this is probably the one you will see in the office.The red canister with cream label is the foam option, which works well on wood fires, paper, textile and liquid fires, such as petroleum, for example. Never use the foam canister on electrical fires, you can cause considerable damage, not only to your offices but to the entire building.The black canister is designed for use on liquid and electrical fires and these are often found in factories and industrial sites. Finally is the yellow label, this is the wet canister which is used on wood, paper and cooking materials. This is the one that you will find in your kitchen at home or in a commercial kitchen, either in a restaurant, pub or hotel.Now that you know how to differentiate the different fire extinguishers, you need to know how to use them. Your company should provide you with adequate fire safety training, which is a must for all staff at any business. In the event that your training didn’t cover how to use these devices, they are simple to use, as long as they have been serviced and maintained on a regular basis.Firstly before you do anything, check the pressure on the canister. It should have good pressure, preferably full. Standing a good distance from the flames, you will want to pull out the pin, when you do this it breaks a seal, enabling you to use the fire extinguisher to fight the fire. Don’t be a hero, if the flames are getting too out of control, it’s time to leave and let the fire department sort out the problem. In the event the fire has just started and the fire is moving horizontally along the office floor, you will want to gently squeeze the lever and aim for the base of the fire, moving across and back. Should the fire be reaching for the ceiling, then you want to gently squeeze the level while starting at the base and then moving upwards and back down again.If you are successful and manage to put out the fire, concentrate on any hot spots to reduce the risk of them re-igniting, then evacuate the building and wait for the fire department with everyone else.